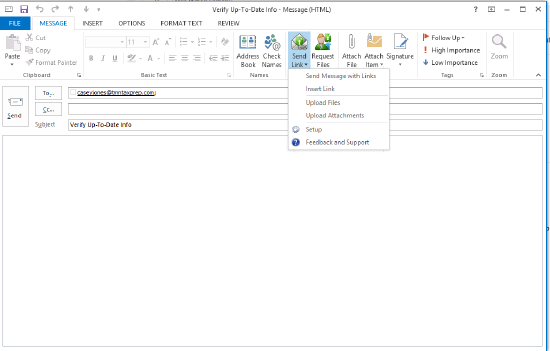 You can use the Outlook plug-in to directly include links to vaults, folders, or files to users with access to your SmartVault account. 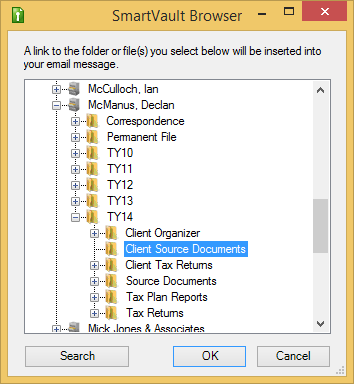 For tax and accounting plans, you must have granted access to the vault, folder, or file before the recipients to which you send these links can view the location in your SmartVault account. For business plans, including Reckon Business and Partners Plans, you can invite clients right from the plug-in. 1. Sign into SmartVault on your desktop. 2. Open Outlook and click New Email. 3. Enter the email addresses for the intended recipient(s). 4. Click the Send Link menu. 5. 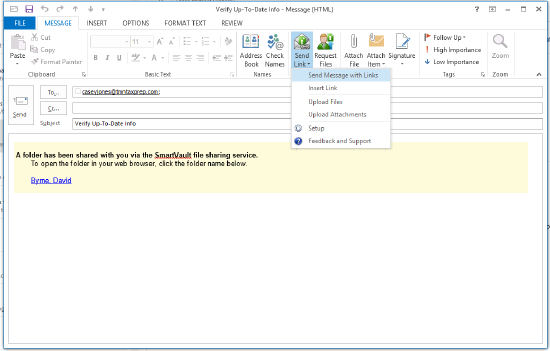 Select Send Message with Link to include a message with the link, or select Insert Link to only include the link. 6. Navigate to the vault, folder, or file to send and click OK.
7. Finish composing your email and click Send.